Patrick Twumasi’s goal-scoring consistency for FC Astana is unquestionable as he did over the weekend. Joseph Paintsil nearly cost his side the needed maximum points after receiving a red card in the early minutes of Ferencvaros win. Bernard Mensah also suffered the same fate for Kasimpasa but his side did not survive as they lost to Antalyaspor. Elsewhere, Frank Acheampong scored his first hat-trick since moving to China as they edged out Tianjin Quanjin in the Tianjin derby. Jeffery Schlupp suffered another injury blow as he was taken off in the 24th minute for Crystal Palace in their 2-0 win at Huddersfield Town. Collins Quaner lasted full throttle for the losers but Timothy Fosu-Mensah warmed the bench for the victors. Daniel Amartey missed Leicester City 2-1 loss against Chelsea in the FA Cup through injury. Jordan and Andre Ayew both missed Swansea City 3-0 loss against Tottenham in the FA Cup quarter-final through suspension and cup-tied respectively. In the Championship, Albert Adomah failed to inspire Aston Villa to victory in the 72 minutes he played as they were pipped 1-0 at Bolton Wanderers. Andy Yiadom lasted full period for Barnsley as they were beaten 2-0 at home by Millwall. Caleb Ekuban lasted 70 minutes for Leeds United s their struggles continue after losing 2-1 to Sheffield Wednesday at the home. Dennis Odoi played full throttle for Fulham FC in their 2-2 draw with Queens Park Rangers at the Craven Cottage. Phil Ofosu-Ayeh missed Wolves 3-1 win over Burton Albion through injury. In League One, Bernard Mensah warmed the bench for Bristol Rovers in their 3-2 loss at Plymouth Argyle. Kevin Luckassen lasted 79 minutes for Northampton in their 3-0 loss at home to Rotherham. Kwesi Appiah missed AFC Wimbledon 1-1 draw at Rochdale through injury. Tarique Fosu lasted full minutes of action for Charlton Athletic in their goalless draw with Fleetwood Town. Joe Dodoo missed the game for the Addicks through injury. In League Two, Hiram Boateng played full throttle for Exeter City in their 2-1 loss at Morecambe. Elsewhere in the lower leagues, Nana Ofori-Twumasi and Darius Osei were not part of Maidstone that beat Sutton 1-0 at home. Kwame Thomas was taken off at halftime for Solihull in their 1-1 draw with Torquay. Nortei Nortey warmed the bench for Dover Athletic in their 2-0 win over Macclesfield. Koby Arthurmissed the game for the losers through injury. Goalkeeper Declan Appau was not included in Woking squad that played 2-2 draw with Wrexham. Harold Odametey lasted 54 minutes for Maidenhead in their 1-0 loss to Barrow. Mubarak Wakaso was an unused substitute for Deportivo Alaves in their 3-1 loss against Valencia at the Mestalla. Sulley Muntari made a cameo appearance for Deportivo La Coruna in their 1-1 stalemate against Las Palmas. Thomas Partey lasted full throttle for Atletico Madrid in their 2-1 loss against Villarreal at the El Madrigal. Emmanuel Boateng climbed off the bench to score the winner for UD Levante in their 2-1 victory over Eibar. In the Segunda Division, Yaw Yeboah did not make the matchday squad for Real Oviedo in their 2-1 win over Granada. Kwadwo Asamoah lasted 65 minutes for Juventus as they were held to a goalless draw at struggling Spal. Alfred Duncan warmed the bench for Sassuolo in their 2-1 win at Udinese. ClaudeAdjepong lasted 81 minutes for the victors. Isaac Cofie was not added to the Genoa squad that lost 1-0 at Napoli. Godfred Donsah played 90 minutes for Bologna in their 1-1 draw at Lazio. Afriyie Acquah played 90 minutes for Torino as they were downed 2-1 by Fiorentina at home. In the Serie B, Bright Addae enjoyed full throttle for Ascoli in their 2-1 win over Ternana. Isaac Donkor picked a booking but completed 90 minutes for AC Cesena in their 2-1 defeat at Foggia. Moses Odjer made a cameo appearance for Salernitana in their goalless draw at Frosinone. Patrick Asmah warmed the bench for Salernitana likewise Emmanuel Besea for Frosinone but there was no space for Yusif Rahman Chibsah in the hosts’ squad. Enock Kwarteng missed the Nantes squad that played 1-1 at Metz through injury. Goalkeeper Lawrence Ati-Zigi kept a clean sheet for Sochaux Montbilliard in their goalless draw with Tours. Grejohn Kyei did not make the matchday squad for Stade Reims as they kept their grip on top spot of Ligue 2 after beating RC Lens 3-1. Ebenezer Assifuah lasted 65 minutes for Le Havre in their 2-1 loss at Chateauroux. Bernard Tekpetey did not make the squad for Schalke 04 in their 1-0 win at VfL Wolfsburg. Baba Rahman missed the game for the Royal Blues through injury. Kevin-Prince Boateng registered his name on the score sheet for Eintracht Frankfurt as they swat aside Mainz 05 3-0 at the Commerzbank-Arena. Gideon Jung lasted the full period of action for struggling Hamburg SV in their 2-1 home loss against Hertha Berlin. Defender Joseph Baffo missed Eintracht Braunschweig 3-2 win over Duisburg through injury. Steffen Nkansah was not added to the visitor’s squad. Kwame Yeboah replaced Christopher Antwi-Adjei in the 77th minute for Paderborn in their 2-0 win over Zwickau. Marcel Appiah was an unused substitute for VfL Osnabruck in their 1-0 against Preussen Munster. Agyemang Diawusie lasted 59 minutes for SV Wehen in their 4-2 win over Erfurt. Michael Akoto did not make the victors squad. Kadiri Mohammed returned from a long layoff to warm the bench for Austria Vienna in their 5-0 mulling at Red Bulls Salzburg. David Atanga scored the consolation for St. Polten in their 2-1 home loss to Admira Wacker. Majeed Ashimeru picked a booking but lasted full minutes for AC Wolfberger in their 5-1 walloping at Rapid Vienna. Samuel Tetteh continued his superb form for LASK Linz as he scored in their 3-0 win over Mattersburg. Samuel Oppong missed BW Linz 3-1 loss at home against Hartberg through injury. Gideon Mensah enjoyed another 90 minutes for FC Liefering in their 1-0 win over FAC Vienna. Kingsley Boateng warmed the bench for Ried in their 3-1 home loss against league leaders Wacker Innsbruck. Joel Fameyeh netted the winner for Dinamo Brest as they came back from a goal down to beat Slutsk 2-1 in the 2nd leg of the Belarusian Cup quarter-finals. Joseph Aidoo played fantastically well for KRC Genk in their 1-0 defeat to Standard Liege in the Belgian Cup final. Ishmael Baidoo was an unused substitute for Septemvri Sofia in their 2-0 win over Vereya. Edwin Gyasi made a cameo appearance for CSKA Sofia as they pipped city rivals Levski Sofia 1-0. Ohene Carlos was again the main man for Beroe during their goalless draw with Bristritsa. Richmond Boakye-Yiadom was again missing for Jiansung Suning as they were hammered 4-1 at Chongqing Lifan. 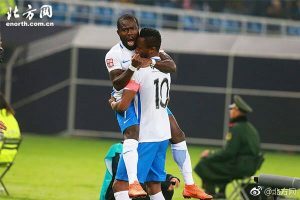 Frank Acheampong scored his first hat-trick for Tianjin Teda in their 3-2 win over Tianjin Quajian in the Tianjin derby. Maxwell Boadu Acosty made a cameo appearance for Rijeka in their 5-1 thumping of Cibalia. Obeng Regan warmed the bench for Inter Zapresic as they came back from a goal down to beat Lokomotiva Zagreb 3-2. Ahmed Said played full throttle for Hadjuk Split in their 3-3 draw with Osijek. Benjamin Tetteh was taken off in the 90th for Bohemians 1905 in their 2-0 win over Teplice. Moro Ibrahim warmed the bench for Silkeborg in their 1-3 loss to FC Copenhagen. Ernest Asante played 90 minutes for FC Nordjaelland in their 1-0 loss at Helsingor. Jonathan Amon was not added to the visitor’s matchday squad while Godsway Donyoh missed the game through injury. Kelvin Mensah made a cameo appearance for Brondby in their 2-1 win over Hobro. Evans Mensah scored for HJK Helsinki 4-1 win over VPS in the Suomen Cup. Anthony Annanalso played a significant part in their victory. In-form Joseph Paintsil was shown a direct red card for Ferencvarosi in their 4-1 win over Puskas Academy. Patrick Twumasi opened his league scoring account for FC Astana in the 2-0 win at Zhetysu Taldykorgan. Arago Jamal and Abdul Bashiru played full minutes of action for FK Pristina in their 1-0 loss at Drenica. Rashid Sumaila was a stalwart for Al Qadsia in their goalless draw at Kazma SC. After scoring an own goal last week, Francis Afriyie recovered to hand his team MurciÃ©lagos FC the three points in their 1-0 win over Juarez. Joseph Owusu Bempah was not included in MurciÃ©lagos FC matchday squad. Jonathan Opoku was not included in VVV Venlo squad that lost 3-0 at PSV Eindhoven. Derrick Luckassen missed the match for the victors through suspension. Thomas Agyepong missed NAC Breda 1-0 loss to Roda JC through injury. Asumah Abubakar missed the matchday squad for Willem II in their 2-2 draw at FC Twente through injury. In the Eerste Divisie, Leroy Owusu warmed the bench for Almere City in their 4-1 defeat at Jong AZ Alkmaar. Shadrach Eghan did not make the squad for Go Ahead Eagles in their 1-1 draw with Telstar. Rodney Antwi lasted 75 minutes for Volendam in their 2-1 loss at Jong PSV. Adam Kwarasey helped Valeranga beat Odd 2-1 at home. Abdul Majeed Waris did not make the squad for FC Porto in their 2-0 victory over Boavista. Emmanuel Hackman enjoyed 90 minutes of action for Portimonense in their 1-1 stalemate at Vitoria Setubal. Muniru Sulley was not included in Tondela squad that lost 2-1 at home to Maritimo. Lumor Agbenyenu made a cameo appearance for Sporting Lisbon in their 2-0 win over Feirense. In the Segunda Liga, Osei Barnes lasted 57 minutes for Africa in their 1-0 win over Academica. Ernest Ohemeng was not added to the visitor’s squad. Joseph Amoah was an unused substitute for Guimaraes B in their 2-1 win against Aves. Kwame Nsor made a cameo appearance for Academica Viseu in their 1-0 win over CD Cova. Raphael Dwamena and Kassim Nuhu both played 90 minutes for FC Zurich and Young Boys respectively, but it was the latter’s side that won the game 2-1. Richard Ofori was once again superb for Maritzburg United in their 2-1 win over Polokwane City. Anas Mohammed played 90 minutes as Free State Stars were beaten 2-1 at Chippa United. Samuel Darpoh was not added to Amazulu squad that recorded a goalless draw at Kaizer Chiefs. Bernard Morrison was not included in the Orlando Pirates squad that beat Golden Arrows 2-1. Samuel Mensah lasted full minutes for Ostersunds in their 1-0 loss at home to Malmo FF in the semifinals of the Swedish Cup. Patrick Kpozo watched from the substitute bench for the losers while Frank Arhin failed to make their squad. Danny Amankwaa played 89 minutes for Hearts of Midlothian in their 3-0 win against Patrick Thistle. Prince Buaben, who could leave the club after the current campaign, was not included in the Jambos squad. Samuel Owusu lasted 55 minutes for Cukaricki in the 3-3 stalemate with Javor. Abraham Frimpong warmed the bench for Red Star Belgrade in their 2-0 win at Macva. Reagy Ofosu lasted 72 minutes for Spartak Trnava in their goalless draw with MSK Zilina. Sadam Sulley was introduced at halftime for Michalovce in their 2-1 loss at Podbrezova. Issah Abass played 85 minutes for Olimpija Ljubljana in their 3-0 win at Ankaran Hravtini. Ibrahim Arafat Mensah lasted 65 minutes for NK Aluminij as they were hammered 6-1 at Domzale. Elvis Manu made a 32nd-minute introduction for Genclerbirligi in their 1-1 draw with Akhisar Genclik Spor. Kamal Issah returned from suspension to warm the bench for Genclerbirligi. Asamoah Gyan made a cameo appearance for Kayserispor in their 2-0 defeat at Konyaspor. John Boye played his first 90 minutes for Sivasspor this season in their 1-0 defeat at Bursaspor. Emmanuel Agyemang Badu missed the game for Bursaspor through injury. Joseph Attamah lasted full period for Istanbul Basaksehir in their 1-0 win over Besiktas. Bernard Mensah was shown a red card Kasimpasa in their 3-2 loss at home to Antalyaspor. Isaac Sackey was not included Alanyaspor squad that played 1-1 draw against Goztepespor. In the Turkish Lig 2, Mahatma Otoo lasted full minutes for Balikesirspor as they were pipped 1-0 at home by Istanbulspor AS. Kofi Atta is still waiting to make his debut for the victors since moving on loan from Bursaspor during the January transfer window. Jerry Akaminko lasted the entire duration for Eskisehirspor in their 1-0 loss at Ankaragucu. Kofi Opare warmed the bench for DC United in their 2-2 stalemate with Houston Dynamo. Chris Odoi Atsem was not added to the DC squad. Dominic Oduro watched from the bench once more as his side Montreal Impact inflicted a 1-0 loss on Toronto FC. Abu Danladi missed Minnesota United 2-1 win over Chicago Fire through injury. Charles Sapong and David Accam lasted full throttle for Philadelphia Union in their goalless draw with Columbus Crew. Ghanaian trio Lalas Abubakar, Jonathan Mensah and Harrison Afful also played full minutes of action for the Crew while Abu Mohammed warmed the bench. Kwame Awuah made a cameo appearance for New York City FC in their 2-0 win over Orlando City. Ebenezer Ofori warmed the bench for the victors. In the United Soccer League, Solomon Asante opened his league account for Phoenix Rising in their 1-1 draw at Orange County. Gladson Awako lasted full action for Phoenix. Ropapa Mensah made a cameo appearance for Nashville as they were beaten 2-0 at Louisville City.